The old part of town, in today’s post. Recent endeavor, specifically the Open House NY weekend event, resulted in one getting invited to a “site hosts” reception over in lower Manhattan last week. I’ll show you where that took place tomorrow, but as always, half the fun of going anywhere is the trip itself. The event invitation was for six in the evening, but since I didn’t have much else to do that afternoon it was decided to “make a day of it” and go wandering with the camera. After laying out food and water for the dog, I left Astoria and began my meandering path, one which ultimately found me in LIC boarding an East River Ferry bound for Pier 11/Wall Street that deposited me in the financial district. That’s the “House of Moses” flying around the Brooklyn Bidge, right at the corner of Dover and South Street, in the shot above. My destination was on the east side of Chinatown, a section of Manhattan which offers a series of particularly interesting artifacts dating back to the early 19th century that somehow survived the “urban renewal” and “slum clearance” era of the middle 20th century. You can spot all three historic types of tenements in this neighborhood “pre,” “old,” and “new” law structures. It’s also a bustling section – crowded, messy, and full of different cultures bumping up against each other. 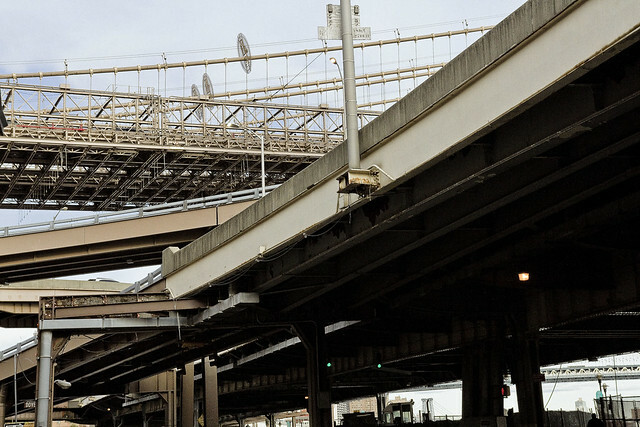 The section of highway from 23rd Street to 34th Street was built on wartime rubble dumped by cargo ships returning from Bristol, England, during World War II. The German Luftwaffe bombed Bristol heavily. After delivering war supplies to the British, the ships’ crews loaded rubble onto the ships for ballast, then sailed back to New York, where construction crews made use of it. You can take the boy away from his beloved Newtown Creek, but that doesn’t mean he’s not still fascinated by sewers. 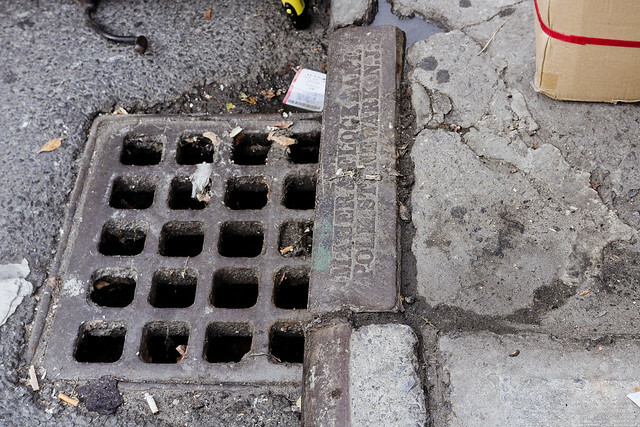 This non standard drain was spotted just to the southeast of the footings of the Manhattan Bridge. It was maybe 16 inches across, and clearly an artifact of the early city. My moles inside the modern day DEP tell me that the sewers in Chinatown are amongst the worst ones for them to maintain. Partially this is due to the density of the local population and their particular propensity for dumping greasy materials into the street drains, but it’s mainly due to the age of the local system and the limitations of 19th century engineering. I seem to recall that this was shot along Monroe Street, possibly at the corner of Market, but I didn’t jot down where I found it at the time. Supposedly, there’s a few sewers down in these parts that are lined with lumber rather than concrete. Famously, the DEP was doing repairs on a water main at Beekman Street (and on Chambers) a few years back and they happened on colonial era water pipes that were constructed of hollowed out wooden logs. Log water pipe discoveries are not without precedent. Archaeologists expect to find historical infrastructure such as water and sewer pipes, wells, cisterns and foundations in locations where early New Yorkers lived and worked. In fact, reports of wood water pipe discoveries south of Chambers Street date back at least 100 years. The unique thing about the Beekman Street discovery is that the wood pipes were discovered nearly intact – one pipe is missing its tapered end. What’s even more remarkable is that the pipes were still connected when they were found and form a contiguous section of New York City’s first water distribution infrastructure. 86 Madison Street caught my eye while I was wandering about. Luckily, it also drew the scholarly attention of a person from the University of Delaware named Zachary J. Violette back in 2012, who produced an interesting dissertation comparing the tenements of NYC and Boston – check it out here. Alexander Stake tenement, 86 Madison Street, New York, 1889. Alexander Finkle, architect. A heavily-ornamented New York tenement, this immigrant-built and designed building shows the use of belt courses, pilasters and window support elaboration. The ornate stamped-metal cornice bears the name “Lincoln”, a reference to the president and a typical invocation of power through the use of ornament. 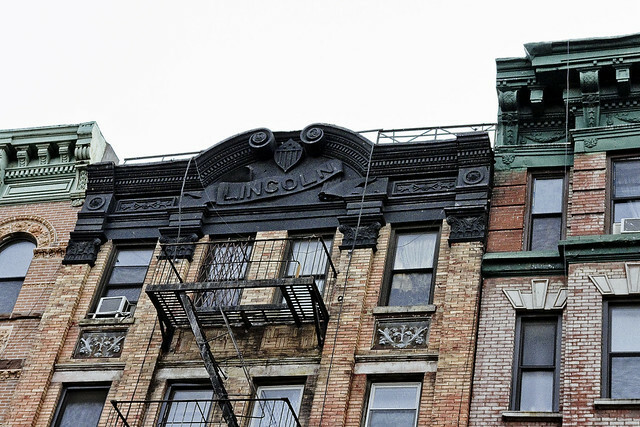 Given the facade work, the date of its manufacture, and a hundred other little details obvious to those of us who have learned how to “read” the City, the Lincoln building and its neighbors are “Old Law” tenements. As to the demographics of these parts, this neighborhood was predominantly Catholic (German and Irish, mainly) and a little bit Jewish (according to Jakob Riis – “Jewtown,” or the “Ghetto,” or as my grandmother called it – “The Shtetl”) was mainly on the east side of Delancey Street back in 1889 when these tenement buildings went up. 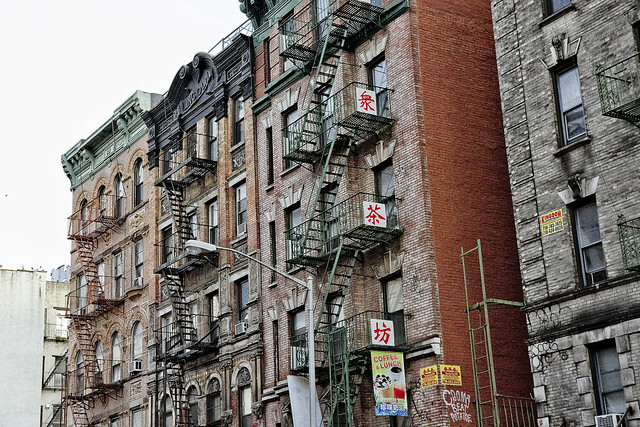 The Chinese began to arrive in NYC in great numbers during the 1870’s, but their original “zone” of occupation was closer to Doyers Street, near Chatham Square, on the west side of the Bowery. When the Germans and Irish began to evacuate this area east of Bowery, the Chinese moved in. Old Law Tenements are tenements built in New York City after the Tenement House Act of 1879 and before the New York State Tenement House Act (“New Law”) of 1901. The 1879 law required that every inhabitable room have a window opening to plain air, a requirement that was met by including air shafts between adjacent buildings. Old Law Tenements are commonly called “dumbbell tenements” after the shape of the building footprint: the air shaft gives each tenement the narrow-waisted shape of a dumbbell, wide facing the street and backyard, narrowed in between to create the air corridor. They were built in great numbers to accommodate waves of immigrating Europeans. The early 21st century side streets of Manhattan’s Lower East Side are still lined with numerous dumbbell structures. My intended destination still awaited me, but I was having a pretty nice time wandering around Chinatown. Hungry, there was a particular meal, available in these parts, which I sought out. Now, this is one of those stories… When my Dad used to force me to work with him on one of his Saturday jobs – he was a house painter who would pick up extra cash on the weekends – it would often be in Manhattan. 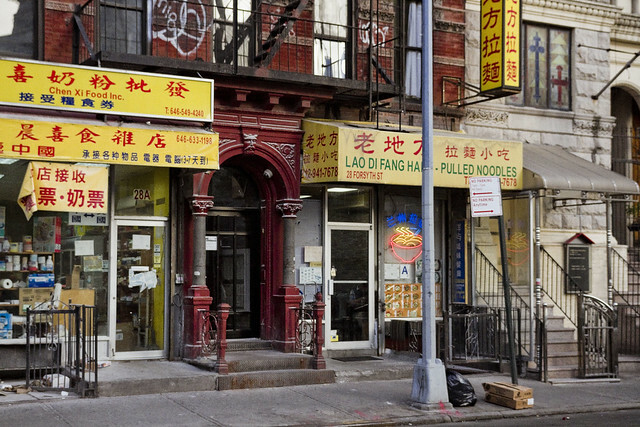 We’d stop off at a Chinese bakery on the west side of Chinatown at the corner of Walker and Mulberry to get a box of “pork buns” and a couple of those ultra strong and ultra hot cups of black coffee commonly offered by such establishments. Whenever I eat this particular meal, I always think of the old man. The “pork buns” are called “Bao” and whereas Chinese bakeries do indeed produce sweet cakes like the more familiar western ones do, they also manufacture incredibly flavorful and savory fare as well. There’s all sorts of variants on these, some are steamed, some filled with custard or dried pork, but a personal preference for the baked ones with the savory roast pork inside is offered. I procured a couple of the baked Roast Pork “Bao” and a cup of that super hot coffee, and then proceeded to sit down on a tenement stoop for a quick dinner before heading off to my eventual destination – which will be described in tomorrow’s post at this – your Newtown Pentacle. Wow, another great one, Mitch! You were stomping around in my mom’s old neighborhood. Love the log waterpipe story. Like you, I am always fascinated by the old “nether” regions of a city. Nice historical piece. I worked on Chambers for over 15 years including 9/11. My kids are German, Irish, Italian, and Chinese!